Posh chocolate shop near Bank Station in the City. 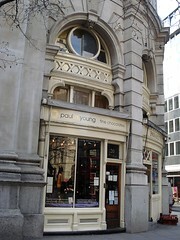 The original branch is on Camden Passage in Islington, and they also have a branch on Wardour Street in Soho. Their focus is on chocolate truffles made with fresh ingredients; these are not long-life, but should be eaten as soon as possible after purchase and at the most within a week. Some of the truffle flavours are produced year-round, while others are seasonal. Kake visited in March 2011 and bought a selection of truffles (£15 for nine of your choice) to share with Sarah and Jo. Port and stilton truffles were disappointingly lacking in stilton-ness; none of us could detect it, which was a bit of a let-down to our expectations. Sea-salt caramel truffles were better, with a beautifully fresh dairy taste. Cassis truffles were also good, with a complex, not-too-sweet flavour. They also offer hot chocolate to take away (£3.95 for a decent-sized takeaway cup); you can customise this to your liking with the half a dozen spices on offer. It wasn't bad, but far too sweet for Kake's taste, making it something of a struggle to finish. Accessibility: A step up to get in, and it's quite small inside. Getting here: Despite the address, it's not actually accessed from inside the Royal Exchange; the frontage is on the pedestrianised passage running between Threadneedle Street and Cornhill, on the opposite side of the Royal Exchange from Bank Station. Last visited by Kake, March 2011. Opening hours taken from the Paul A Young website, March 2014. Last edited 2017-06-11 19:39:51 (version 7; diff). List all versions. Page last edited 2017-06-11 19:39:51 (version 7).